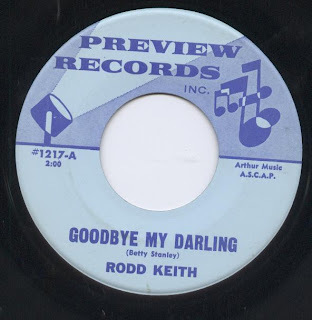 Here's a low-numbered (ie early phase) Rodd Keith Preview single which I have been enjoying recently. I'm a fan of the b-side, which I'll share first, but others who particularly enjoy Rodd may find at least as much to enjoy in the a-side. "Why Don't You Sing a Happy Song?" is downright goofy, from the spoken introduction, to the appropriately peppy, poppy setting, and especially with this moment in the lyrics. "Got a few ragged clothes, but they look mighty neat!" It's also interesting that the only reasons we're given to encourage our singing of "a happy song" are that things in the singer's life are going well enough for him to be happy. I don't know if the timing on the label (1:50) was a typo, or was deliberately misrepresented so as to not make the song-poet feel cheated with what was actually a 92 second track. The flip side, "Goodbye, My Darling", features a nice driving pop sound, an excellent vocal, a catchy tune, and a neat double time bridge. 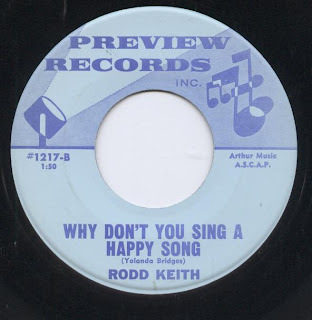 It's the sort of Rodd Keith sounds like it could have been a minor hit around 1966. Unfortunately, my pressing is off center a bit, which becomes particularly apparent during the fadeout. I have very little time this week - in any year, during the third week of May, for several reasons, one of which I'll post about over the weekend. So I am slapping up both sides of a single on the Noval label, MP3's which I made some time ago. I don't know where the 45 is just now, but when I find it, I'll scan it and post the scans. The Noval label may be the most mysterious of all song-poem labels. Their 45's have almost no information - no artist names, just an "arranged by" credit, the name of the song and the songwriter. The most well known Noval record is "The 23rd Channel", which was on one of the song-poem compilations. Great as that one is, its flip side, "Rock, Rocking All the Time" (which has been around in trading circles for years) is almost infinitely better - one of the handful of greatest song-poems ever, in my opinion. This Noval record is not likely to be on anyone's short-list of greatness, but as another side of the song-poem world, it's worth offering. I do like the fact that they often involved a vibraphone in their releases. 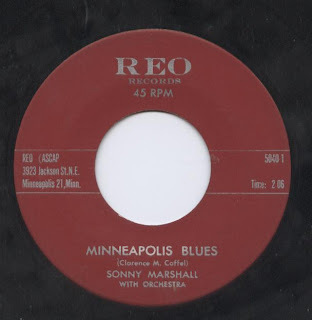 The REO label appears to have existed solely to allow the publication of Song-Poems written by Clarence M. Coffel, the majority of which espouse either patriotic themes, something about Minnesota, or both. Today's first offering is an exception, a Cara Stewart winner, "Gee! How I Wish He Were Taller". 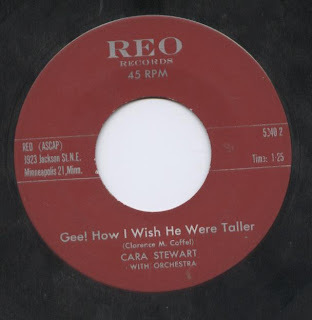 I haven't shared many Cara Stewart records here yet, but she's one of my favorites, a truly excellent singer with a way of selling even the most banal lyrics with a smile in her voice. There's usually a Les Paul and Mary Ford quality to her records, but For once, those similarities (often hard to miss) are downplayed, mostly because of the presence of accordian and viola sounds (perhaps from a Chamberlain?). On to the flip side. Let's play a game. I'll write a word or phrase and you say the first thing that comes into your head. 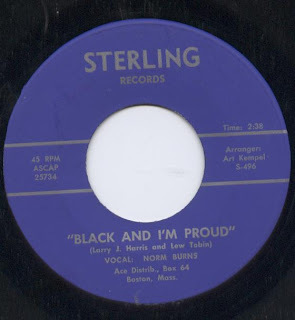 The writer of this song expressed a clearly focused (if not terribly original) point of view and clearly had deep feelings about what he was expressing in his song...and Norm Burns got to sing it. 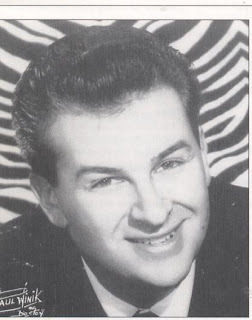 As I said, I really love the Norm's stuff, but he's one of the whitest singers I've ever heard in my life, and since he was really one of only two or three singers at Sterling Records at the time, perhaps his boss, "co-writer" Lew Tobin, might have been better off referring this particular song-poet elsewhere. 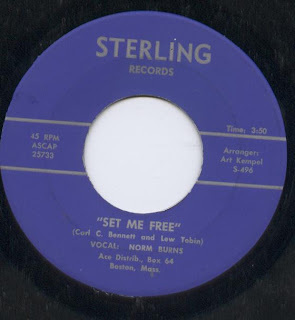 The flip side, "Set Me Free" is not nearly as notable, although I do like that the fairly tortured lyrics flip back and forth between the singer's viewpoint and that of his ex-sweetheart, without consistently indicating who is "speaking". I also love the crazy degree of reverb on this record, which is particularly apparent during the spoken word segment.